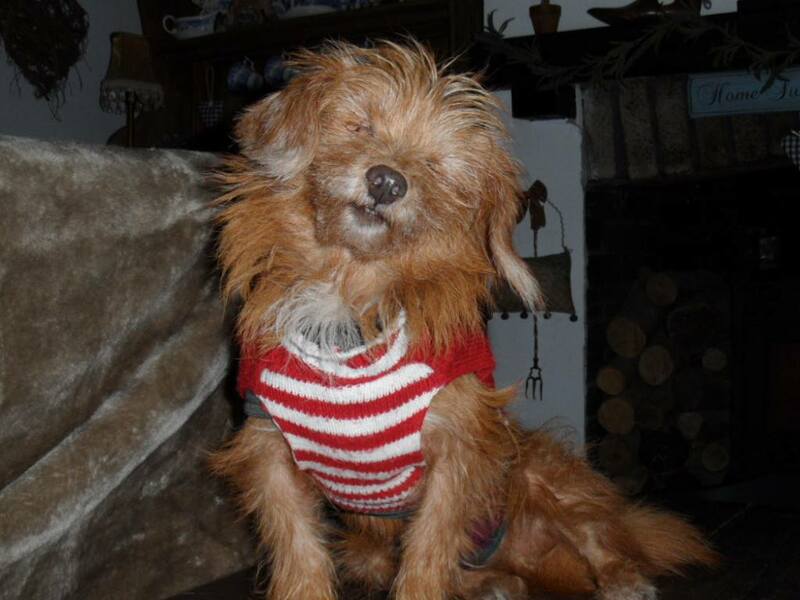 We are so 'happy' that Happy's foster mom will adopt him! 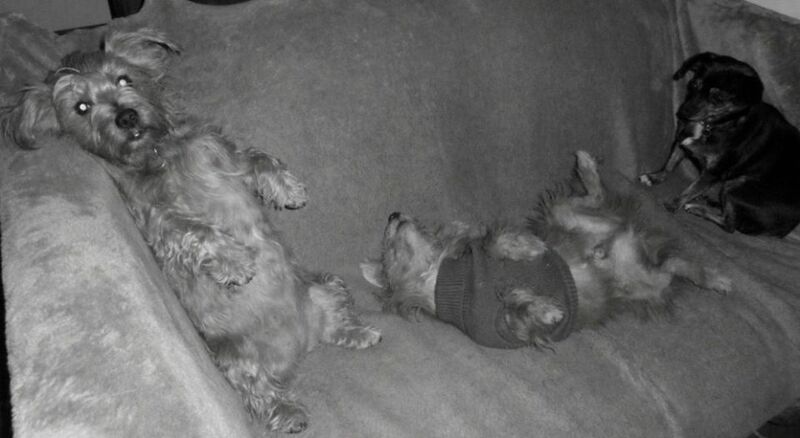 He has settled in with her routine and with his new furry family (Marley is pictured with him). Happy has been having more walks on the leash which is great for him because he has never been walking on a leash before. He also had a brave moment when he jumped up on to Sandra;s sofa! What a brave. 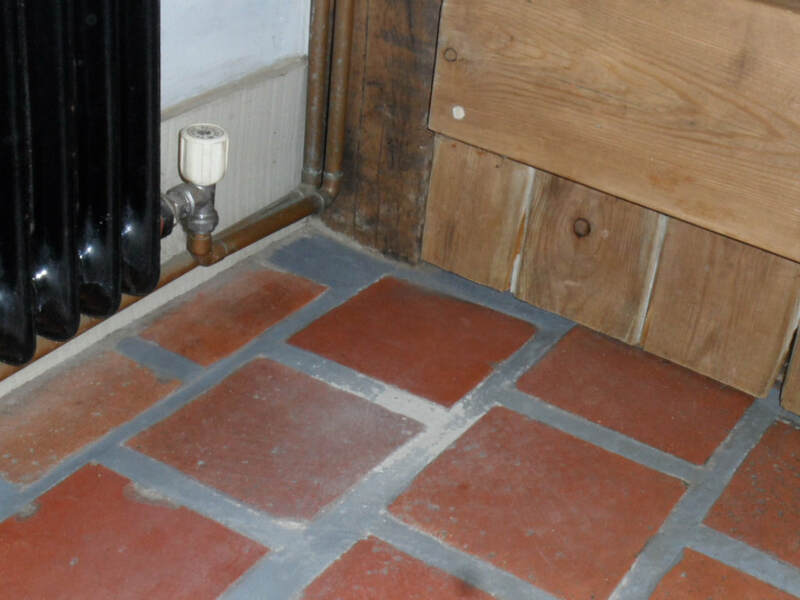 clever boy! 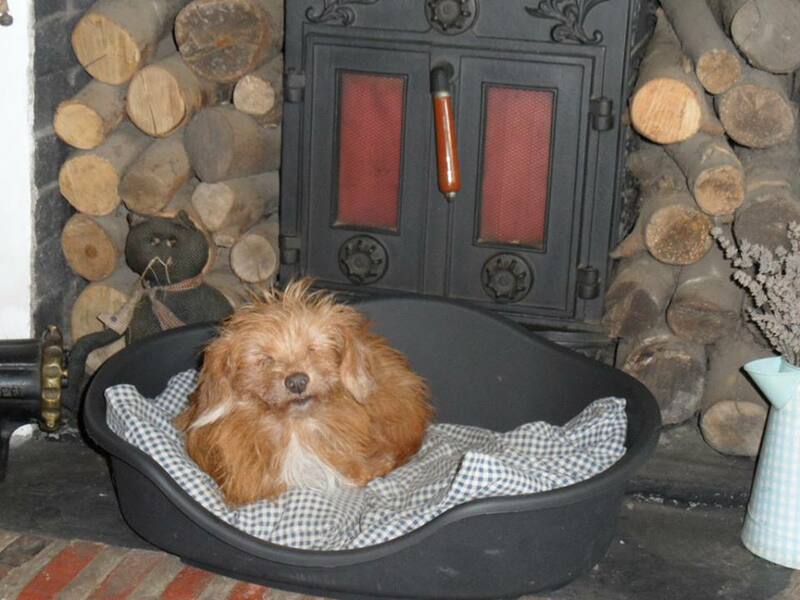 He seems to be doing really well at settling in but he will still go to an adopter in time. 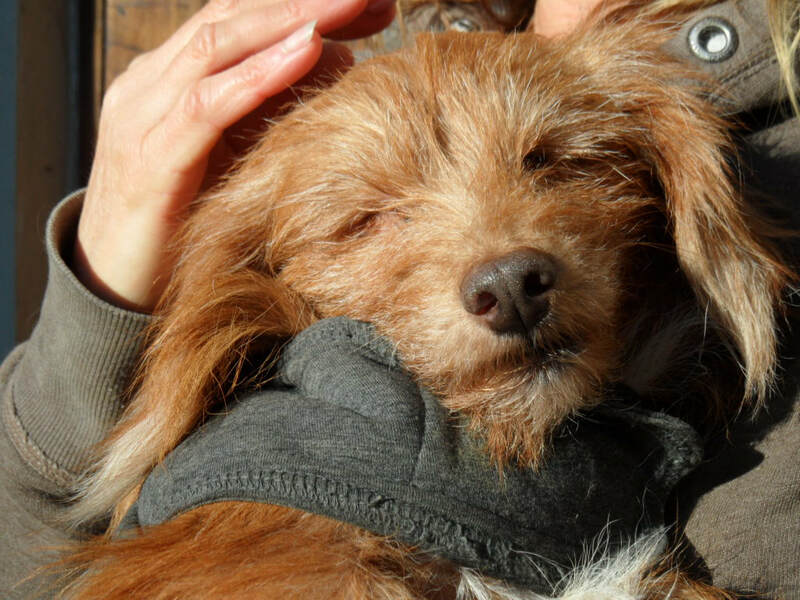 We hope he will find someone who he can spend the rest of his life with, enjoying cuddles and lovely walks and experiences..
Sandra mostly home cooks for her dogs, like Du does, so Happy has been trying couscous, pasta, quinoa, sweet potatoes, different veg and the rice that he is already familiar with and they have all been popular with him. It's nice to know that he is getting a varied diet. 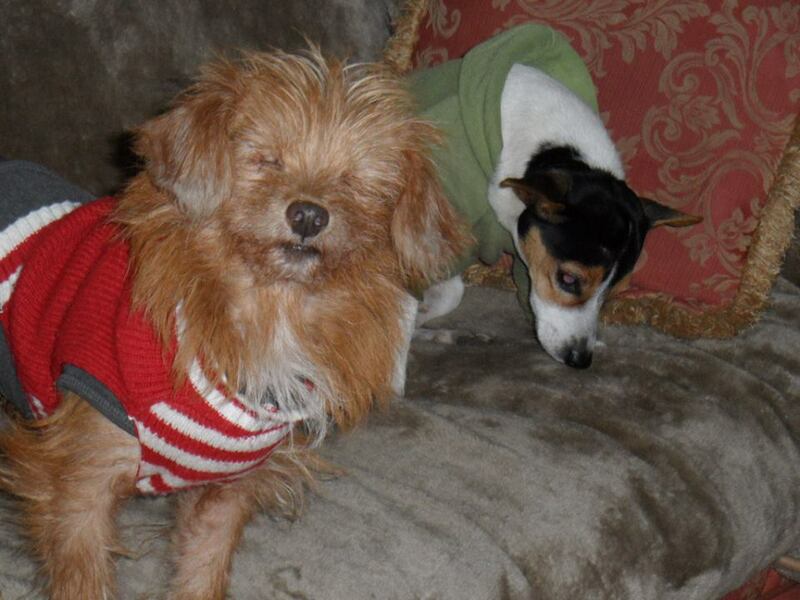 Happy has other dogs for company at Sandra's and he is gradually getting used to them. He is in the garden with Roxy below. Happy has also had his first proper walk in England. 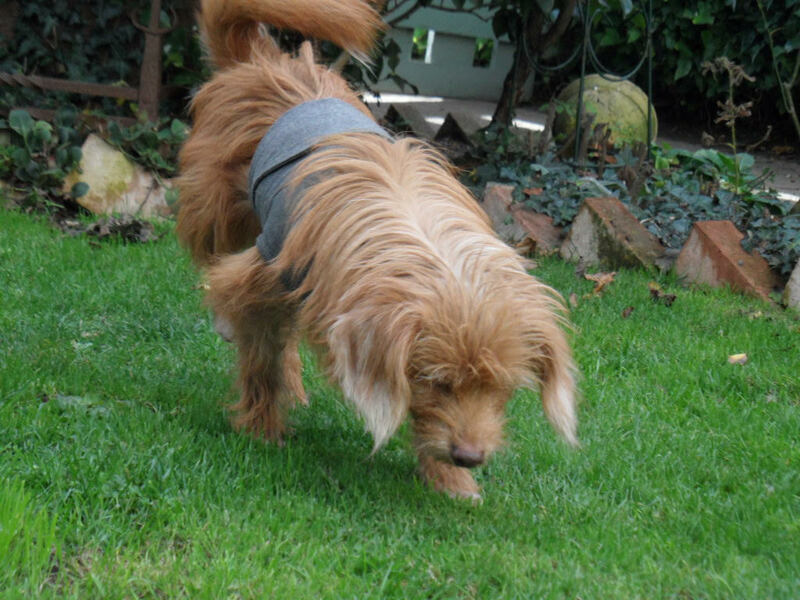 Sandra took Happy to see her vet who told her that Happy has a heart murmur, common in dogs. 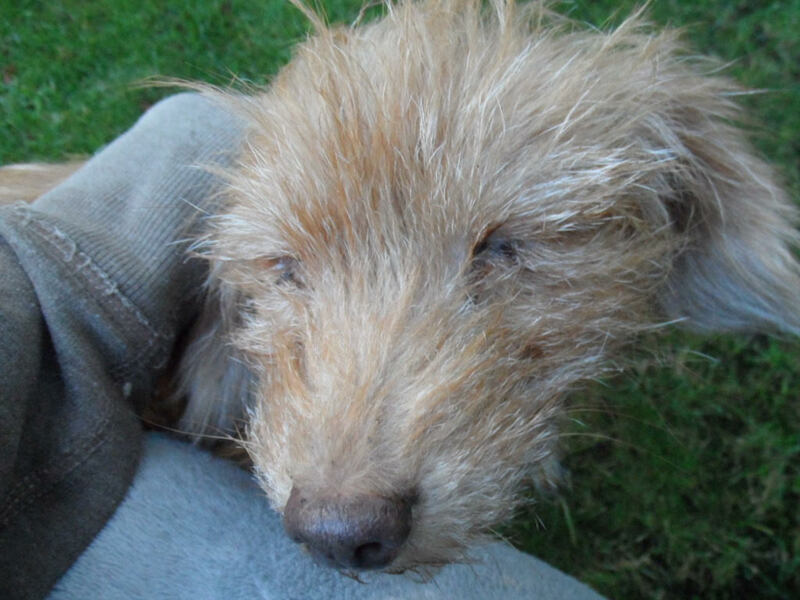 Happy will also be having a dental examination on his next visit. For now, Sandra's lap is still his place of safety. 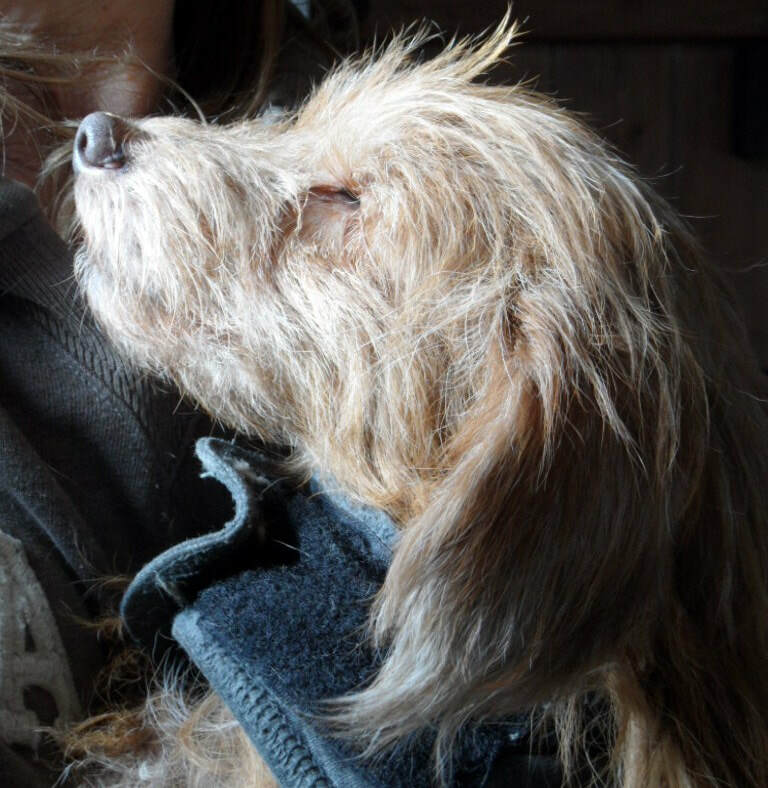 Sandra's lap is a place of warmth and comfort for Shuang Shuang. He feels safe there but he has been growling at Sandra's other dogs when he is on her lap. Sandra says it is more of a fear growl than an aggressive growl but we don't want him to be clingy and not get on with the other dogs and we also don't want the other dogs to start getting jealous of him so Sandra is going to start the introductions to each dog slowly so that everyone knows who the other is. He has always been around other dogs at the shelter but they were the ones he grew up with although when new rescues were introduced he did a lot of sniffing then ignored them so we hope everyone will be ok. Happy is starting to make himself at home at Sandra's. He had a nice, peaceful second night in his warm crate. The crate is a familiar place to him so Sandra is letting him use that as his bed for now. When Sandra took this photo, she said she had no idea how he got up there but he couldn't get down. 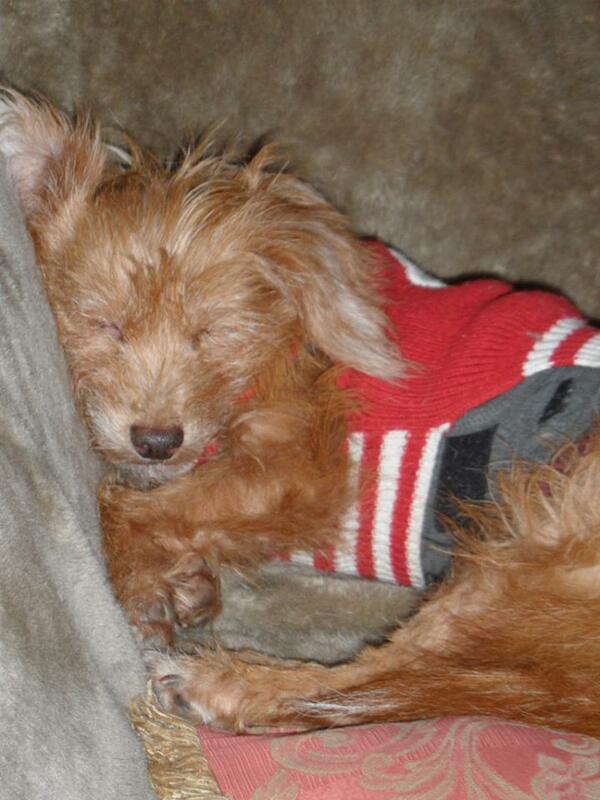 Happy didn't arrive at his foster mom Sandra's until after midnight last night and he was understandably scared. Apart from the long journey to get to England, there were also new smells, sounds, voices, language and also the smells and sounds of Sandra's other dogs for him to get used to. 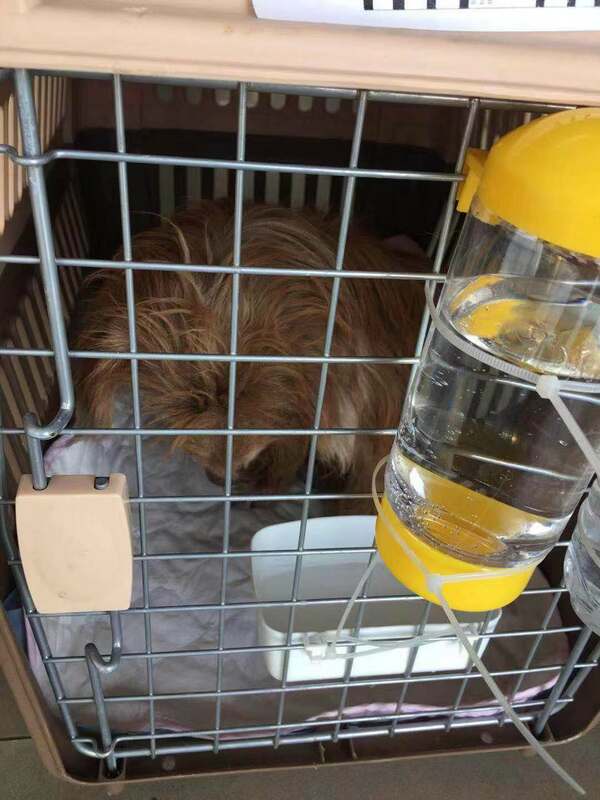 Sandra cleaned his flight crate and put some warm blankets in there so he slept comfortably. Today, he has been in the garden enjoying cuddles to help him settle in and relax. 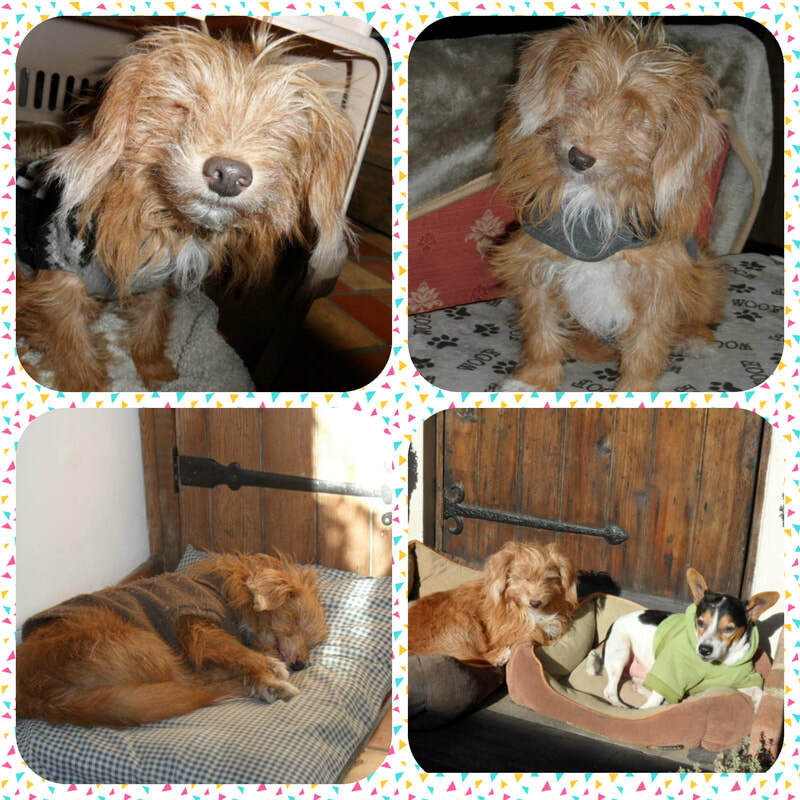 Sandra is going to take the introductions to her other dogs slowly once Happy is more settled. In the shelter, Happy had known no other dogs except the ones he lived with so it is all new to him. 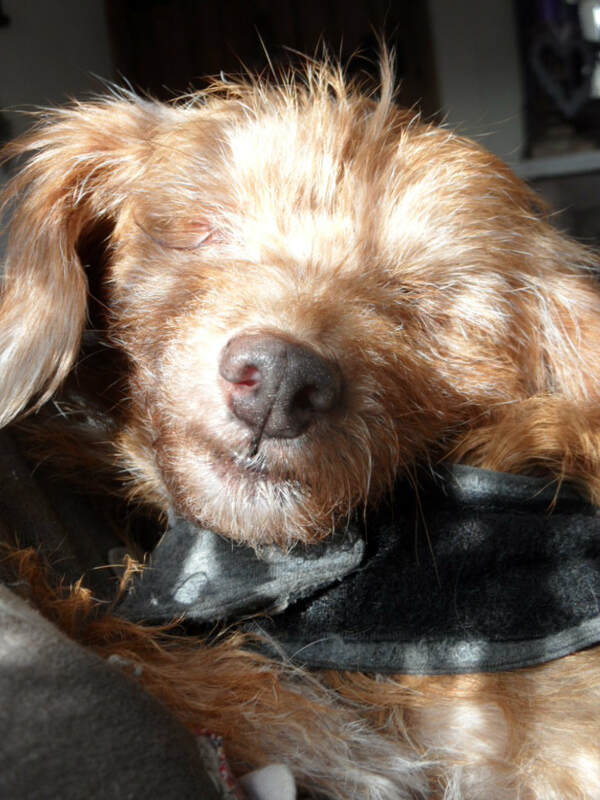 We will receive regular updates from Sandra and Blind Dog Rescue UK. 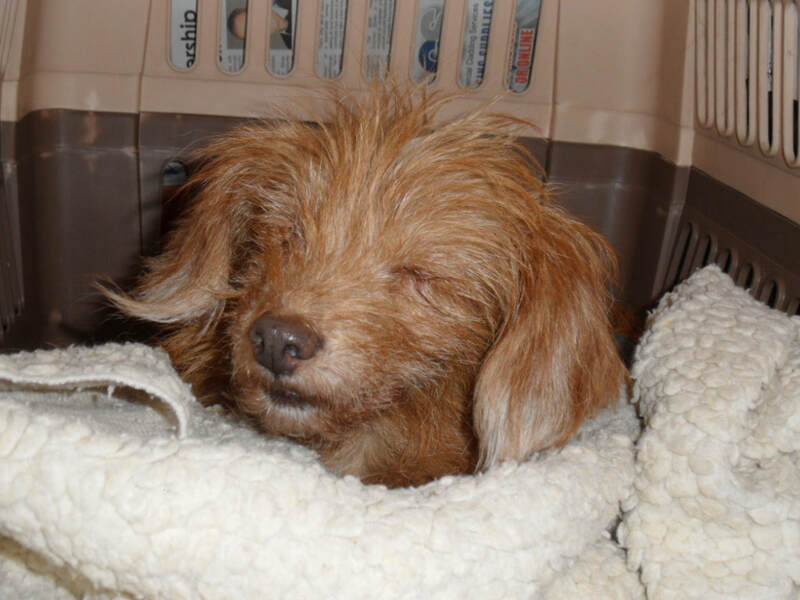 You can watch Happy's new life unfold by subscribing to this blog. Thanks go to everyone involved for giving Happy a chance at a forever home. After half a day of flying from Beijing to London and a long wait at Heathrow Airport while clearance was done, Happy was eventually released. 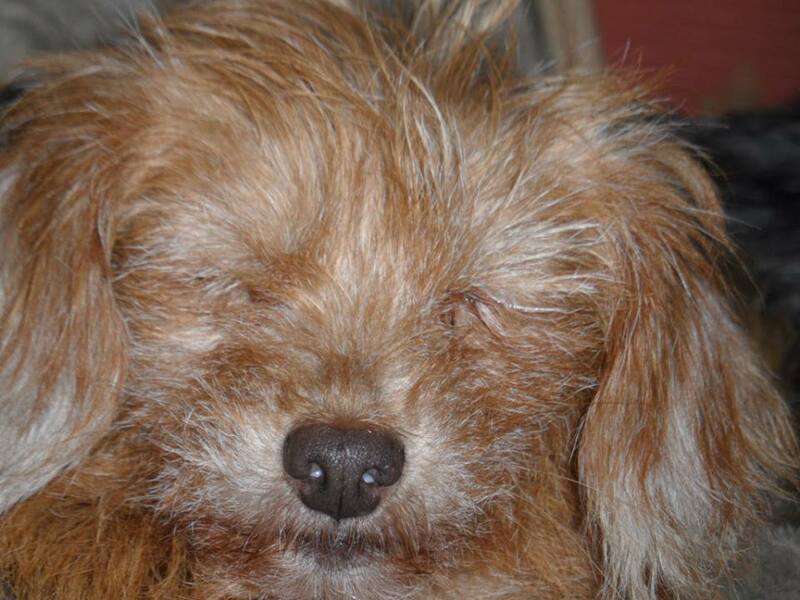 Steve, a driver for Blind Dog Rescue UK collected him and is on his way to deliver Happy to Sandra, his fosterer. 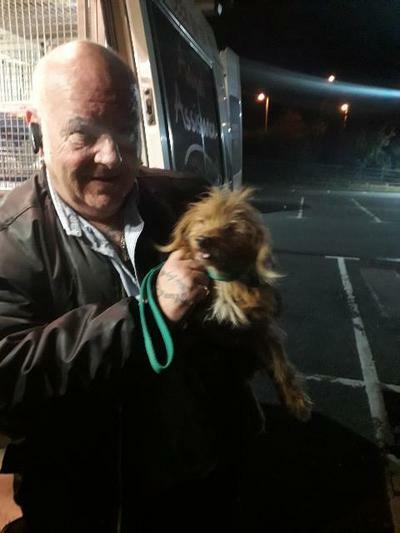 Happy is a little scared says Steve but he is ok and he now lives in England! Today is the day that Happy will leave China forever. 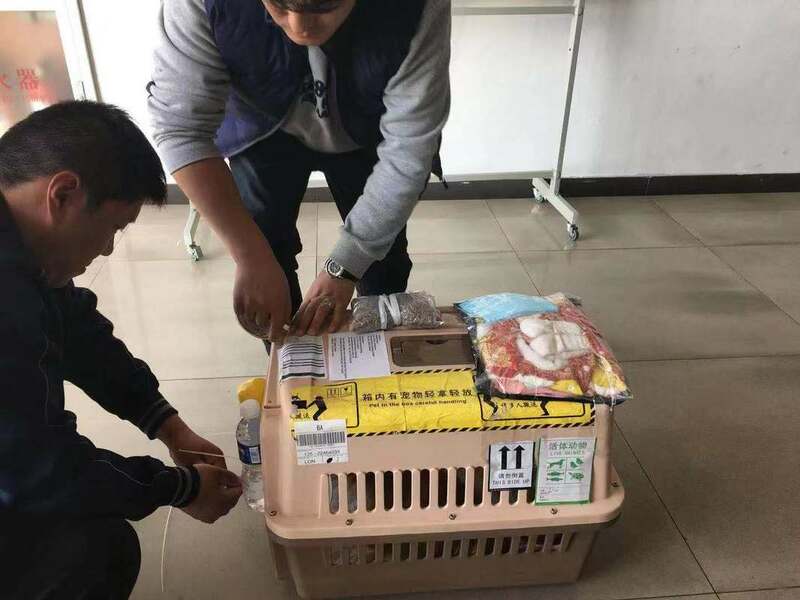 While Wang Yan, at the pet transport company in Beijing, was making sure all the paperwork was ready, her colleague took Happy out for a last walk. He enjoyed the warm Chinese sun on his body for the last time unaware of the new life ahead of him. 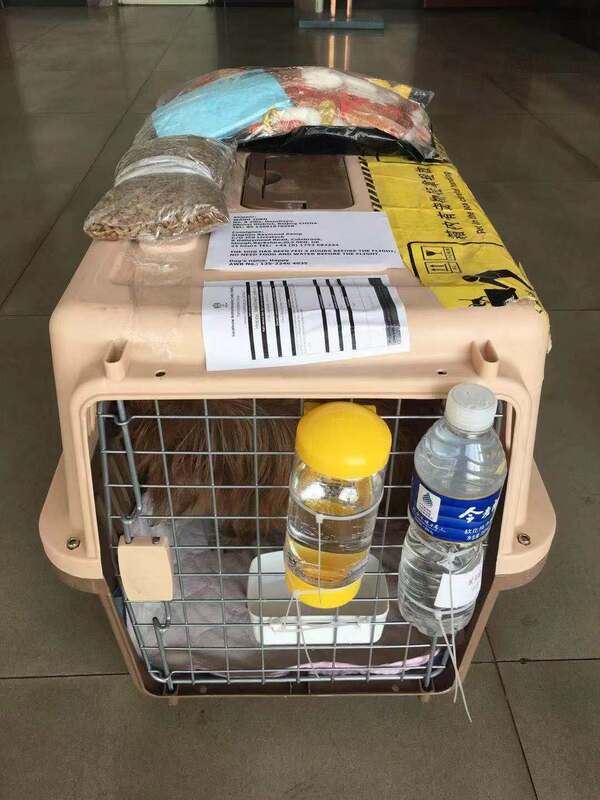 After Happy's walk, Wang Yan's colleagues and airline representatives made last minute preparations including making sure the flight crate met IATA (International Air Transport Association)'s requirements for Happy's comfort during the flight to London. 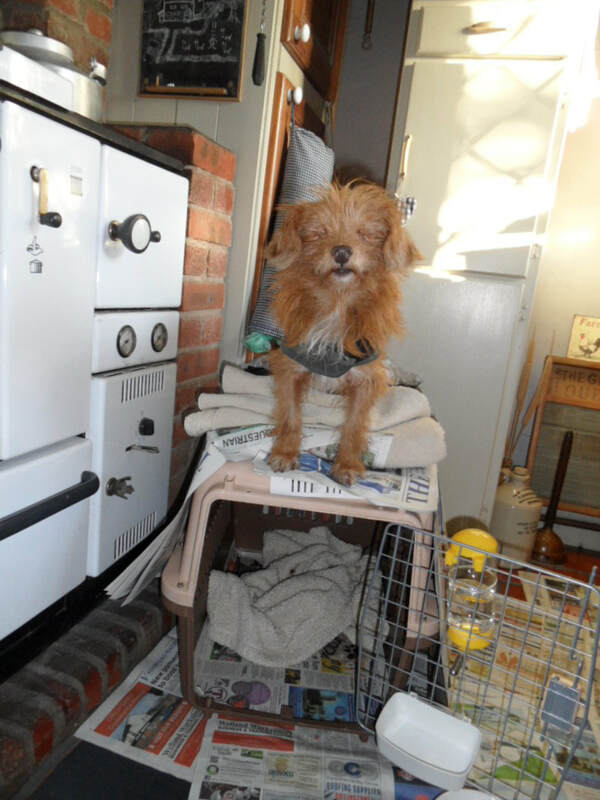 When everything was ready, Happy's crate was fastened and his personal belongings taped to the top of the crate. 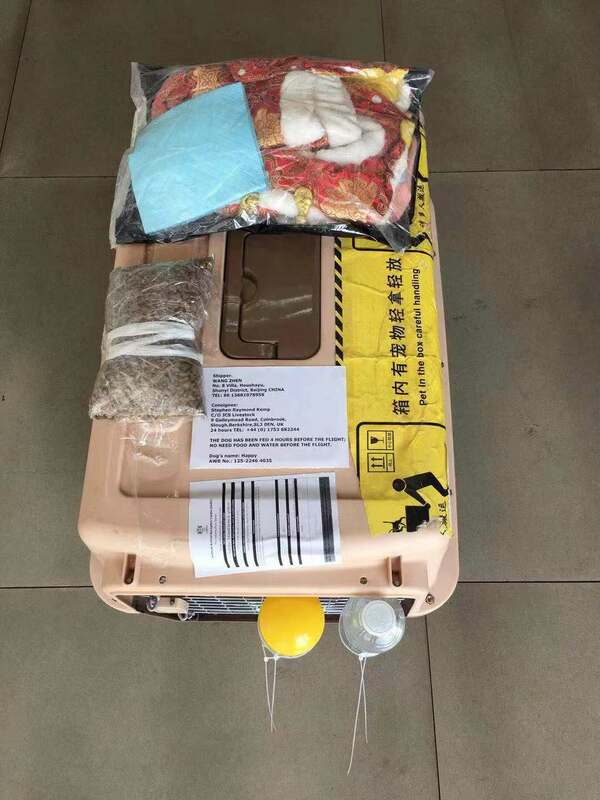 These included some food for when he is released from the crate in London and his little red and gold Chinese jacket. 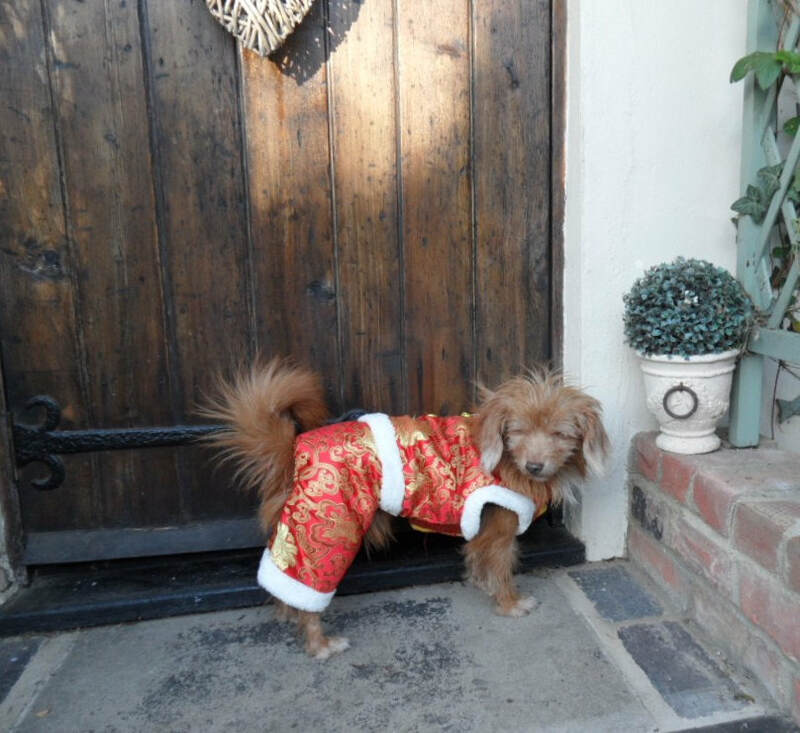 While Beijing was warm, London is getting colder now so Du hopes that Sandra, Happy's fosterer, will put him in his coat while he adjusts to the outside temperature and throughout winter. With Happy safe and secure and ready to be loaded on to the plane, the bitter sweet feelings came to us all because we can't explain to Happy what is happening. 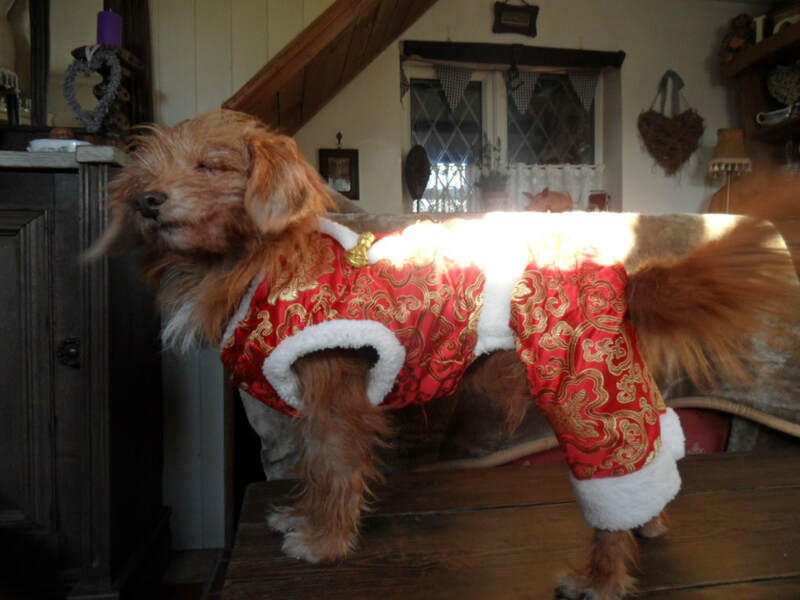 We know his days will be filled with love and lots of exciting new things when he reaches England and no doubt he will get to meet some of the members of Blind Dog Rescue UK without whom he would have had no chance of being adopted in China so big thanks go to you BDRUK! 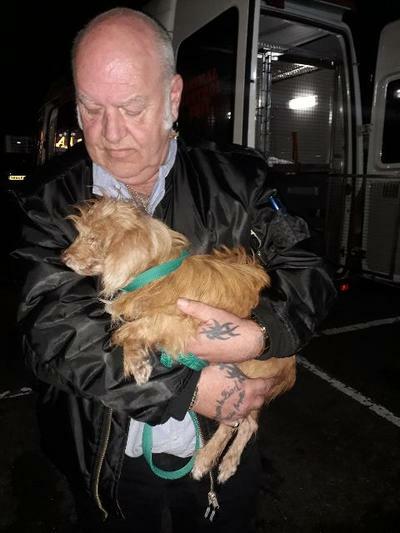 Thank you for giving Happy a second chance. 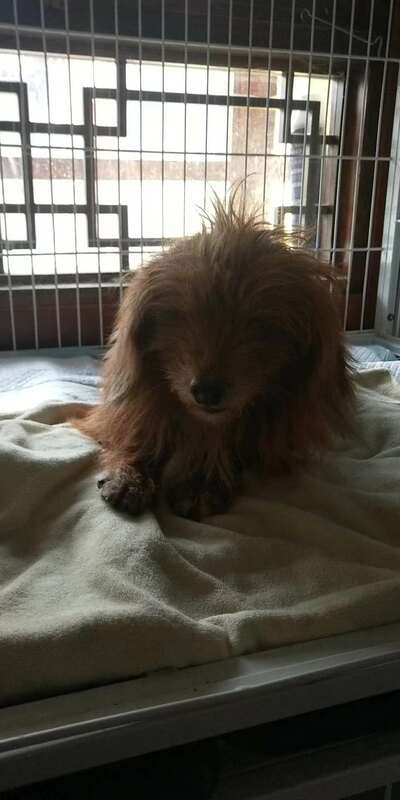 Since the mix up, Happy has been staying at the pet hotel in Beijing. The laboratory were satisfied that the titre test didn't need to be done again so Happy's flight has been booked for him to land in London on Thursday 24th October. In the meantime he has been fussed over and has not been stressed about being in a new place. He is just so inquisitive and wants to explore. 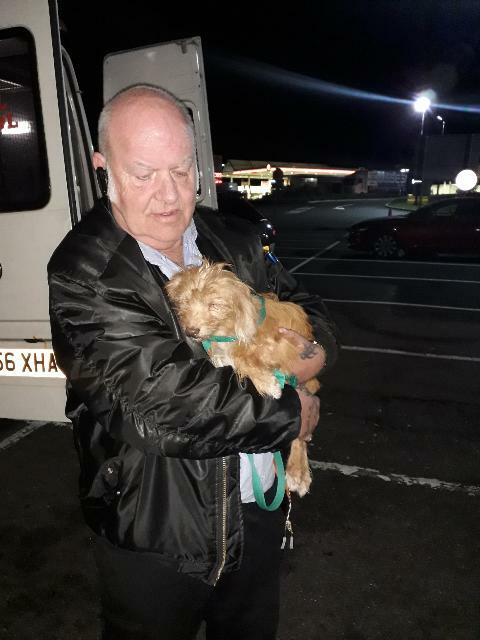 Remember, Happy only knew our shelter, he was abandoned by his owner as a puppy so wouldn't have remembered their place so to know that he hasn't been anxious about being in a new place is wonderful because we know he will settle in well in England at is foster carer's house. 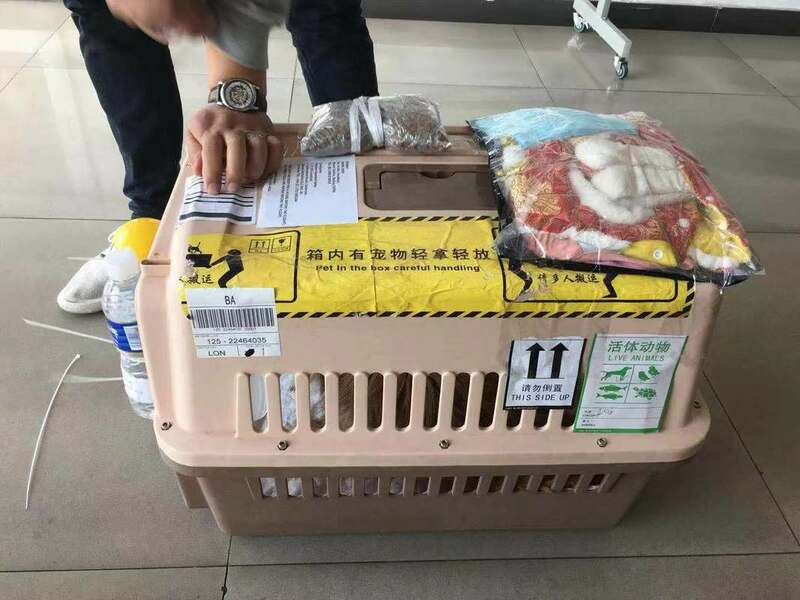 Afew days before Happy was due to fly to England, Wang Yan at the transport company, left his flight crate open so that Happy could get used to the smells and the feeling of being inside it again. 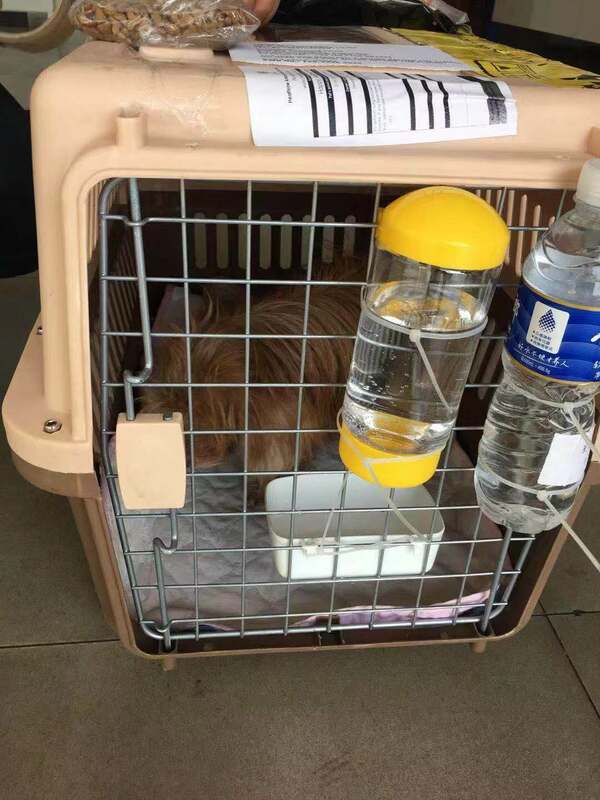 She also learnt Happy to drink from the water bottle which would be attached to the inside of the flight crate door.